I do my best cooking when my wife is standing at my shoulder telling me when to adjust the heat and what ingredients to add next. I know, that’s pretty lame. And that’s why I’m very interested in the SmartPrompt Pan that’s being launched by Key Ingredient through an Indiegogo campaign. 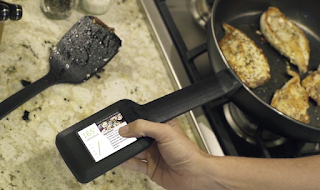 It looks like a perfect gadget for experienced cooks as well as a kitchen klutz like me. The SmartPrompt Pan is a 12-inch skillet-style non-stick fry pan that has a digital display built into its handle. The display shows the temperature of the pan, which allows for precisely timed cooking. The pan also has boiling, simmering and burning detectors that will send alerts to the cook’s Apple or Android smartphone. Even better, the display provides step-by-step directions using Key Ingredient’s library of more than 2 million recipes. Users can upload their own favorite recipes and see them on the pan’s display as well. Cooks who want one of the first SmartPrompt Pans can pre-order one for $99 at the Key Ingredient website. Check out the video below for a closer look and follow @KeyIngredient on Twitter.